For those of you at ALA Annual in New Orleans, you can probably relate when I say we were all moving full steam ahead. With temperatures in the 90s and high humidity, most everyone you met had a bit of a glow and varying degrees of moisture clinging to them from the steamy, long days spent running to meetings that seemed miles apart. While the Fahrenheit was certainly high, it was the steam of ALSC’s hardworking members and their various committees that kept us moving forward. During the convention, process committees were meeting to make important decisions and plan next steps for exciting projects. Some of the children’s book and media award committees were discussing new titles under consideration for various honors. 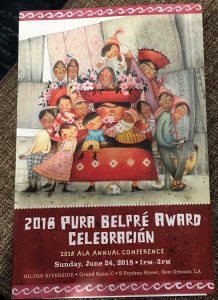 At the same time, other committees such as the 2018 Pura Belpré Award selection committee were celebrating their winning authors and illustrators. Exciting ALSC co-sponsored programs were also being held such as the United States Board on Books for Young People (USBBY) session about the art of children’s book translation, “The Four D’s of Translation in Children’s Publishing: Diversity, Drag, Disguise, and Delectation” and The Asian Pacific American Librarians Association President’s Program “Wandering Wonderland: How an Outsider Found Her Way In,” which highlighted the beautifully diverse work of author-illustrator LeUyen Pham. The creation of Equity, Diversity, and Inclusion (EDI) Fellowships to support membership and attendance of racially and ethnically diverse librarians serving children to ALA Conferences. The development of a white paper on library outreach for underserved children and their families, written by Kathleen Campana, J. Elizabeth Mills, and Dr. Michelle H. Martin, based on the findings of Project LOCAL—an IMLS-funded planning grant. The development of cultural competence and cultural humility training and educational materials for librarians serving children. During ALA Annual, REFORMA presented the Resolution to Reunite Detained Migrant Children with their Parents at ALA Council. The ALSC Board unanimously voted to endorse this resolution on Saturday of the conference and the decision was reported via a blog post of the ALSC Public Awareness Committee. The post succinctly surmised why this issue is relevant to our association: “ALSC is committed to engaging communities to build healthy, successful futures for all children. The separation of children from their caregivers is an abhorrent policy, as is incarcerating families together. 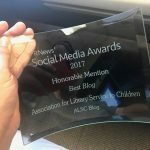 Supporting families is central to ALSC’s core values which include inclusiveness, integrity and respect for children and their families.” Additionally, the post included various ALSC and ALA resources for supporting immigrants, refugees, and asylum seekers. On Tuesday of conference, ALA voted to pass the resolution and two days later REFORMA shared their Statement on the Separation of Refugees, Asylum Seekers, and Immigrants at the U.S. Border Searching for the American Dream. This statement includes a plethora of useful information, resources, tools, and ways to support these families. 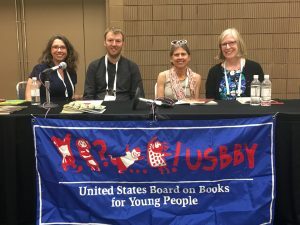 The work of the Pura Belpré Expansion Taskforce, which is considering how ALSC, REFORMA, and YALSA can work together to extend the award to include young adult materials. A report of the Batchelder Evolution Taskforce that addresses how ALSC might broaden the award to bring greater attention to translated books. An early literacy next-steps report of the Every Child Ready to Read (ECRR) oversight committee to determine how ALSC can leverage the work of ECRR to further early literacy research, training, and activity. Immediately after ALA Annual, many ALSC members and leaders transitioned into new roles. New Priority Group Consultants, committee chairs, and committee members started for the 2018-2019 year. At the same time, ALSC leadership changed with four board members (Chris Caputo, Jenna Nemec-Loise, Vicky Smith, and Mary Voors) rolling off the board and four new members (Julie Dietzel-Glair, Elisa Gall, Africa Hands, and Sujei Lugo) joining. Cecilia McGowan also joined as the vice-president/president-elect. I want t o publicly thank each and every one of our active members (those ending appointments as well as those beginning appointments) for your hard work, commitment, and dedication to activities that will engage our communities to build healthy, successful, futures for all children. We can’t do our work without our members! 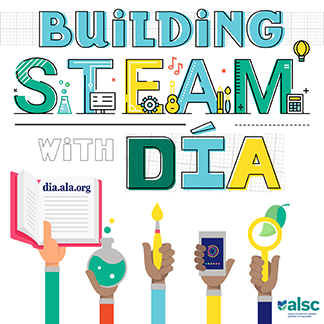 If you are not an active member of ALSC but want to be involved in our activities that are moving full steam ahead, I encourage you to complete a volunteer form available here. I would not fit in at one of these meetings. They sound very political and skewed to one side of the social spectrum where the direction of the organization is determined by perceived, popular sentiment and emotions.